I have used this painting in my leadership labs to describe an old leadership theory. 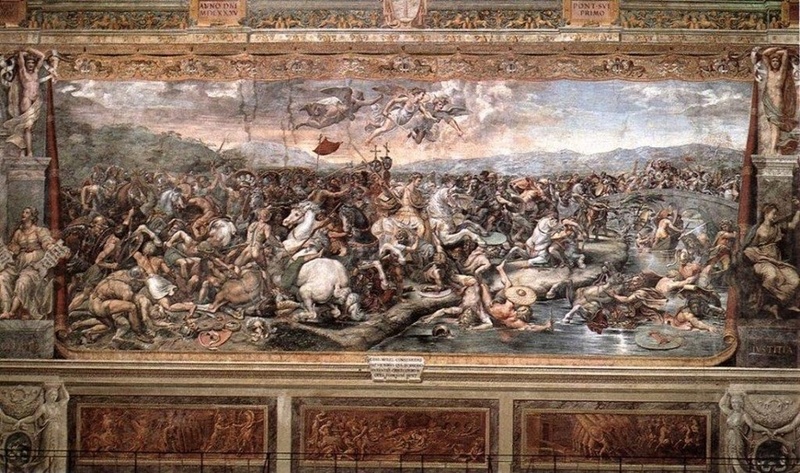 The Battle of the Milvian Bridge, or The Battle at Pons Milvius, is a fresco in the Stanze di Raffaello, in the Apostolic Palace in the Vatican. It is located in the Sala di Costantino (“Hall of Constantine”) and was painted by Giulio Romano and other assistants from the Italian Renaissance artist Raphael’s studio. Raphael died in 1520. It was likely painted between 1520 and 1524 based on a design by Raphael. The Battle took place between Roman Emperors Constantine I and Maxentius on October 28, 312 A.D. Constantine’s victory gave him total control of the Western Roman Empire paving the way for Christianity to become the dominant religion in the Roman Empire and ultimately in Europe. According to a local chronicler, Constantine had a dream where he was ordered to inscribe a sign on his soldiers’ shields containing a chi-rho, the first two letters of the name of Christ. The legend grew further to include Constantine seeing a cross in the sky promising him victory. In Romano’s painting above, sword-bearing angels fly above the battle, directing the troops and securing victory for Constantine. The fresco depicts an idea of leadership that I feel is pervasive in our culture which interestingly enough still influences our perception and conversation about leadership. I hear this over and over again in my classes and it’s time to say it out loud: when we talk about leadership, we don’t need another hero! We need leadership, we say, and that means someone who will make it all better. Someone with vision and know-how. Someone who is trustworthy. A hero leader, someone, like Constantine, who is surrounded by angels. Although the command and control model is well behind us, we continue to willingly surrender our individual freedom in exchange for security. Sometimes I think that the most important job in leadership development work is convincing people that in our time it is impossible to rely on one person to deal with the complex challenges we face. The interesting part of this dilemma, in addition to the creation of a disempowering dependency contrary to the principle of maturity, is its inconsistency with today’s world. If leaders have the answers, why don’t people just do what they say? Why do we talk about the “end of leadership” on one hand and feed the myth of the omnipotent leader on the other? And when the job is done, what is left of the idea of leadership itself? Maybe we should embrace or look for a new word, like Mintzberg attempted a few years ago when he proclaimed that we need more “communityship” and less leadership to mobilize and move us into real and meaningful collective change.